How has InflammaGo helped others? How do I use InflammaGo? Common inflammation in the joints it can cause common symptoms such as pain, swelling, and a deep throbbing or aching. This can happen from a sports related injury or strain. Nearly all sports injuries cause swelling, and this can usually be seen with the naked eye. Pain, redness and heat may also arise at the site of the injury (usually the knee, elbow, wrist, groin or ankle). Swelling inside a joint will likely cause pain, stiffness, and may produce a clicking sound as the tendons snap over one another after having been pushed into a new position from the swelling. The knee and elbow are the common areas to be affected. There are a number of causes of knee swelling, the most common of which is arthritis. InflammaGo is a 100% natural homeopathic remedy formulated to relieve pain and inflammation related to joint stiffness, as well as sports related muscle and joint pain. InflammaGo can been used to safely maintain joint health and support healthy tissues in the body, without harmful side effects. This remedy contains a selection of homeopathic remedies known for their ability to address swelling and tissue inflammation. Due to the concentrated tincture formula, InflammaGo Drops are absorbed into the system with ease – exactly when you need it! Arnica (6C) - is a highly respected natural ingredient and is widely recommended for joint, bone, cartilage and tissue health. Dulcamara (6C) - homeopathic ingredient used to address swelling in areas of the extremities with pain in joints; usually after exposure to cold. Bryonia (6C) - In 1834 Hahnemann proved this homeopathic remedy, which is used mostly for inflammation accompanied by pain on the slightest movement. It is also useful for joints and muscles that are hot, swollen, stiff, and prone to stabbing pain. Berberis (6C) - Berberis is given homeopathically for a particular type of pain, typically described as deep, sharp or radiating outward. Also used for general joint and muscle aches in the arms and legs. Rhus tox (30C) – this homeopathic remedy is mainly used to address musculoskeletal problems, cramps, sprains, and strains. InflammaGo contains no gluten, artificial flavours, colours or preservatives. It is suitable for vegetarians and safe for all ages. 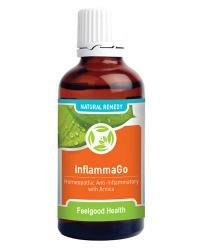 InflammaGo is presented in a concentrated 50ml tincture formula, making it easy to take. Hold bottle upside down and administer 10 drops directly into the mouth. Alternatively dilute 10 drops in quarter cup water and sip slowly. Children under 12 use 5 drops. Dosage may be repeated 3 - 5 times daily if needed until symptoms subside. May be used with JointEase Plus and RealHeal Massage Oil if needed. InflammaGo supports the body on a cellular level – helping to support pain-free joints - from the first dose. InflammaGo contains homeopathic ingredients in a tincture formula that facilitates rapid absorption into the system – just when you need it! One bottle of InflammaGo will last approximately 30 days (depending on frequency of use). Remedy to soothe inflammation plus healing massage oil!